I’m about to be a dad, and there’s plenty of things I’m excited and nervous about. Diapers, sleepless night, fatigue, and am-I-doing-this-right are all things that fall under the nervous category, whereas playtime, cuddles, and reading time are things that fall under the excitement category. 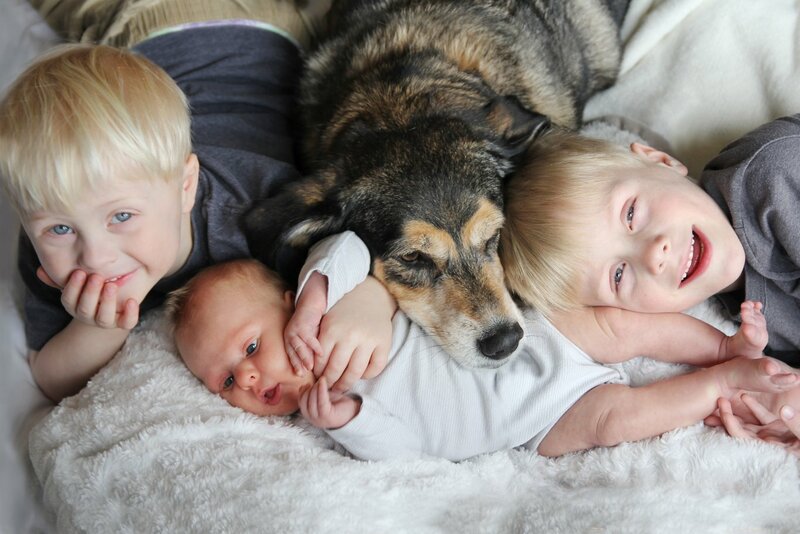 One thing that definitely falls under both categories is introducing our newborn baby to our dogs. We have two dogs. Princess is a 60-pound dog that is half-pit, half golden, and all love. Niko is a 20-pound excitable cockapoo. The thought of introducing our baby to our two dogs, and what it will be like living with a baby and two dogs, brings a lot of questions and concerns to the front of my mind: will our dogs accept our baby? What will they think of this little human? Will they understand he’s a baby? Will they be protective of the baby? Will they, heaven forbid, try to hurt our baby? Princess is my dog. Despite that I raised her, though, she seems to prefer my wife. She follows her around the house and gets upset when she sees my wife walk out of sight when we go hiking. It doesn’t bother me, it just means Princess has accepted my wife, and that I chose the right wife. She’s also super affectionate and loves physical contact. Honestly, I think she’s going to fall completely in love with the baby. My wife and I are concerned mostly that she’ll try to be too affectionate with the baby. She’ll probably want to groom him excessively - that means she’s going to want to lick him from head to toe, think she’s cleaning him. She’ll probably also want to lay next to our baby - a concern that she may unintentionally smother or suffocate our baby. Niko is my wife’s dog. He’s super protective of her - he doesn’t really like it when I walk over to give my wife a kiss. When I do so, he’ll bark at me, sometimes lunging towards me. That said, I do believe he’s accepted me into his pack. After my wife leaves for work in the morning and before I get up to get ready to go to my job, Niko stays in bed with me. Princess, on the other hand, prefers to go to the living room and lay on the couch. There have even been times where Niko has been just as overprotective of me - yapping at my mother - when my wife was not around. I often joke with my wife that our son will be Niko’s new favorite. He’ll bark at her when she goes to pick up our son. I don’t think he will bark at her when she does interact with our son, but I do think he will see it as his job to protect our baby. It probably will only be a big problem if he wakes the baby up with his barking. While I have concerns, I think everything will be okay. We’ll have to keep an eye on the dogs and our baby, but the dogs will eventually accept that this new little human is going to be part of the household, the pack, and their lives forever. And besides, when the little guy begins solid food, somebody’s got to clean up anything he throws on the floor! I think it’s great that you’re thinking about these things ahead of time. Just means you’re going to be a great dad! If you need any support or ideas to help your dogs through the transition, please ask! There is a huge group of dog behavior counselors who are part of the Family Paws Parent Education program (myself included) who specialize in helping expectant families and their dogs, along with parents with toddlers and their dogs. You are already thinking about this transition, which puts you ahead of most people! Learning to read your dog’s body language is key in helping to alleviate everyone’s stress and improve safety for all. Good luck and congratulations on the new addition!